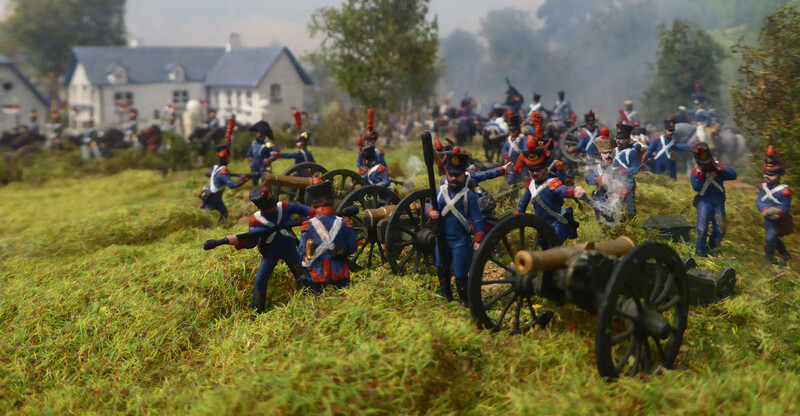 Napoleon, Emperor of France, employing his favourite strategy of the central position has invaded Belgium on the 15th June. The Prussian army covering the frontier has retreated towards Sombreffe whilst the Allied army has failed to mobilise.
' Napoleon has humbugged me ' states the Allies premier general, Sir Arthur Wellesley, 1st Duke of Wellington on hearing the invasion news. Having split the Allied armies successfully, Napoleon appoints Marshal Ney to command his left wing advancing on Frasnes. Ney arrives at approximately 5 PM with his ADC, Colonel Heymes to assume his duties. He finds his new command strung out on the march and attempts to find out where everybody is. 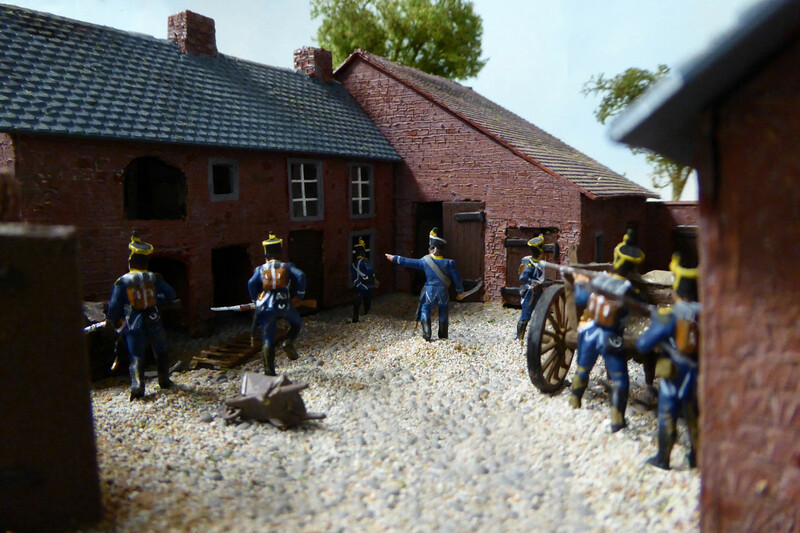 Meanwhile, a short distance from Frasnes, at Quatre Bras, Prince Bernard Von Sachsen-Weimar, commander of the 2nd Nassu brigade decides to ignore the Dukes orders to concentrate at Nivelles and advises his commander of his decision. As a result of this action Baron Perponcher-Sedlnitsky, commanding the 2nd Netherlands Division decides to concentrate at Quatre Bras too. 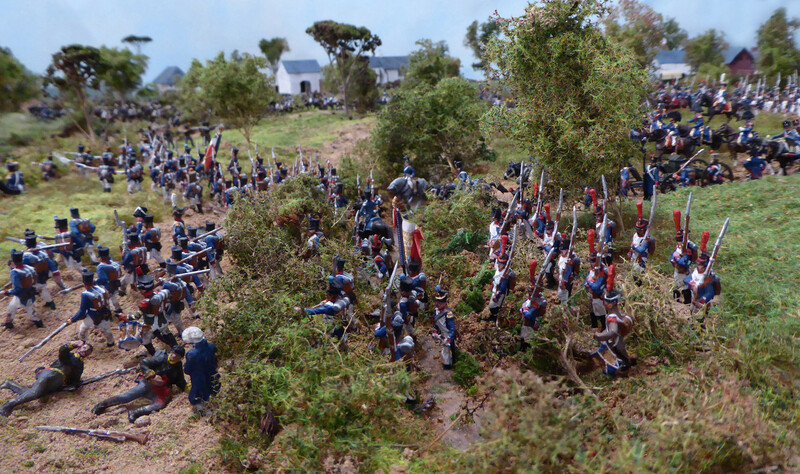 This act of insubordination means that there is at an Allied presence at Quatre Bras as opposed to none at all. The strategic importance of this junction is that whilst being the main highway to Brussels it also through the old Roman road of Nivelles to Namur, that Wellington's army is still tentatively linked to Blucher's Prussian army. 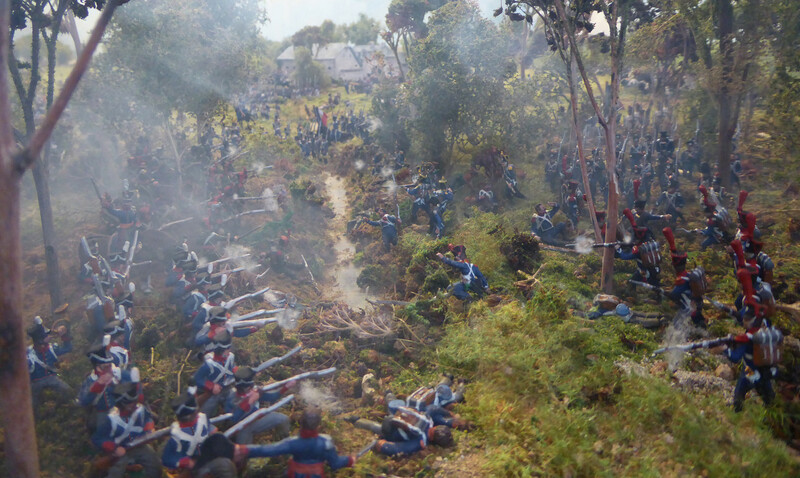 Possibly due to a lack of staff officers, tiredness ( allegedly hung over) or a desire for specific orders from his Majesty as operations evolve, Ney has made no effort to close up his command or advance on Quatre Bras on the morning of the 16th June. However, around noon an Imperial messenger arrives with specific orders from his Majesty to march forward and destroy all opposition. Timeline Morning 16th June 1815 to 2PM. French Chasseurs from the 6th Chasseurs a cheval question local refuges about the whereabouts of the Allied Army. 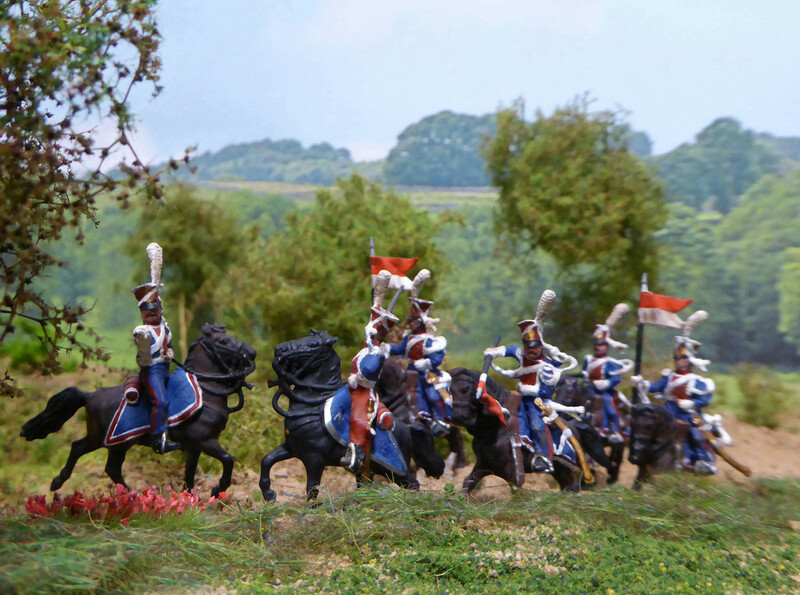 Polish lancers from the Elba squadron, Chevau-Legeres-Lancers de la Garde Imperial reconnoitre the Dutch Belgian position near the Bois de Bossu. Prince Bernard von Sachsen-Wiemar, commanding 2nd Infantry Birgade discusses the situation with his officers at the Ferme de Quatre Bras. Belgian foot artillery commanded by Captain Emanuel Stevenart position themselves between the Bois de Bossau and Ferme de Gemincourt. 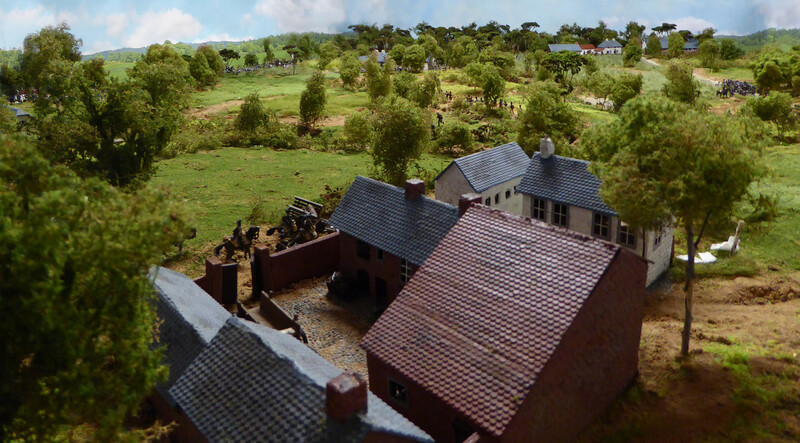 Gemincourt farm is occupied by elements of the 2nd Regiment Oranien-Nassau. 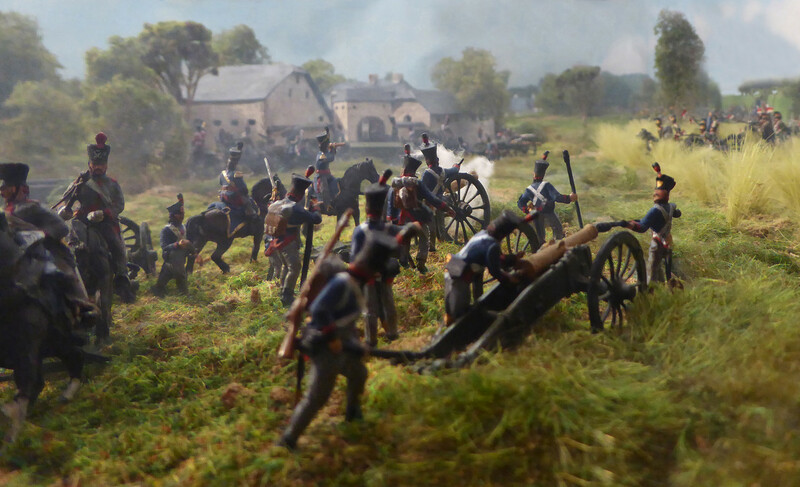 Nassau troops enter the Bois de Bossu to take up position. 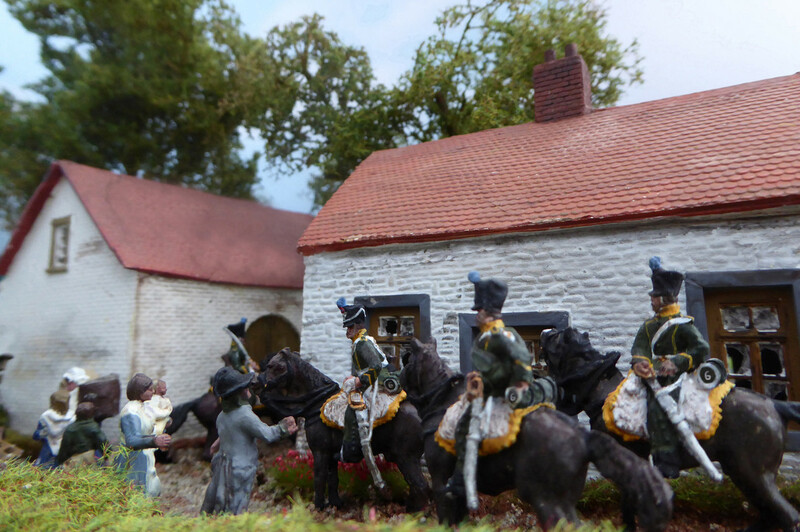 The Duke of Wellington together with William Frederik, Prince van Oranje, commanding 1st Corps examine the French activity from outside Ferme de Gemincourt. 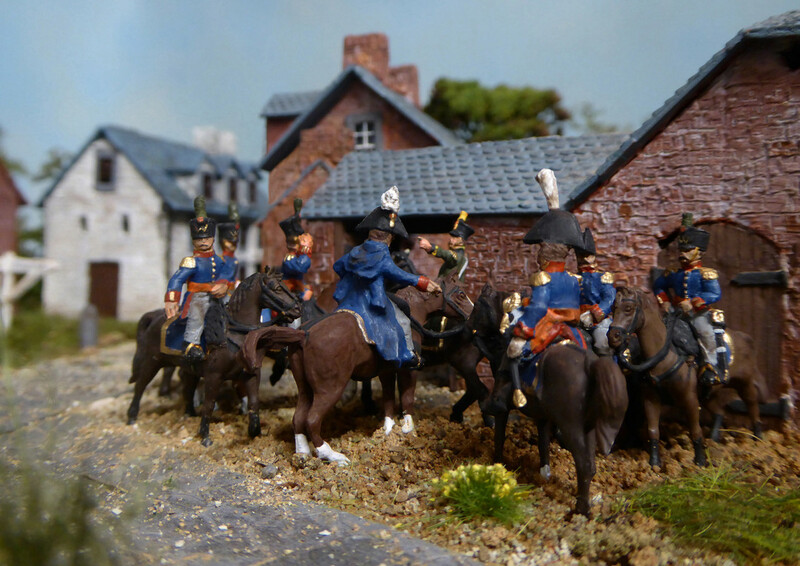 The Duke having approved the Prince's dispositions will shortly depart to meet with Feldmarschall Blucher at Brye. 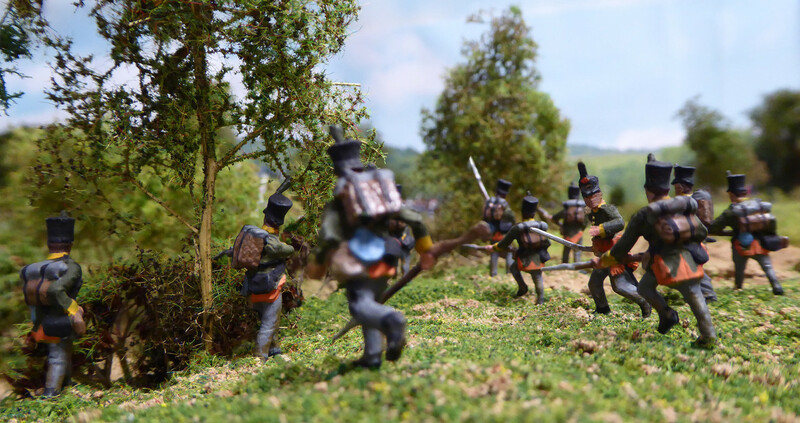 Dutch skirmishers from the 27th Jager Battalion engage with French voltigeurs in an attempt to keep the French off guard and exaggerate the Allied presence. 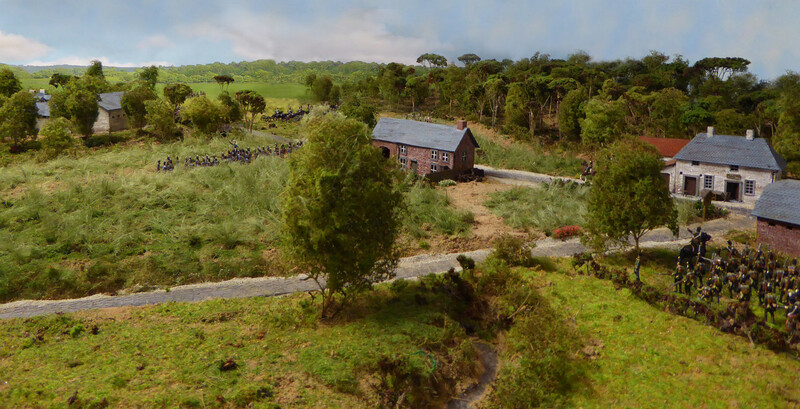 7th South Netherlands Line Battalion arrives from Nivelles and is directed into position. 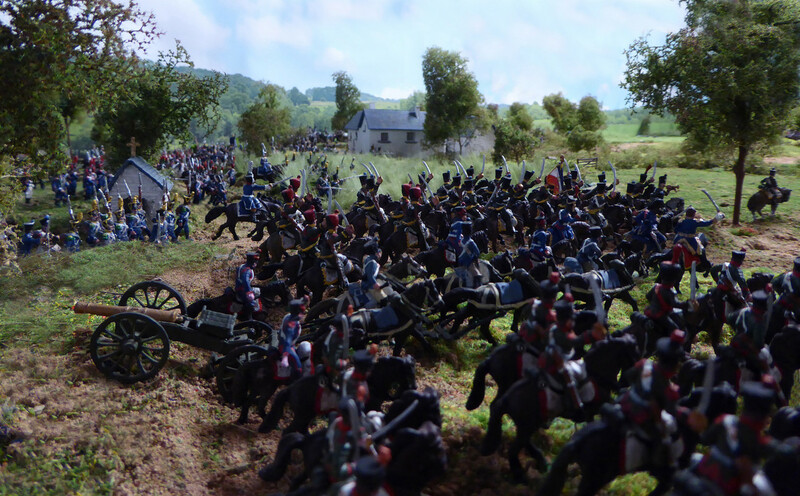 Marechal Michael Ney, Duc d'Elchingen, Prince de la Moskowa observes the Allied positions from the Bois de L'Hutte. Lieutenant-general Honore-Charles, Comte Reille commanding 2nd Corps is vary of being ambushed by the Allies. The undulating terrain and tall crops mean that the Allied dispositions are almost invisible to the French. However, the Emperor's orders must be obeyed, Avant mes braves, a Bruxelles! Like to see how the story will develope.. 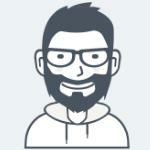 If the location of your images has been changed at Postimage this wont work, so Dont edit your files there! Edit: note the Forum is now self correcting so there should be no need to alter any older links. Thank you Ironsides. Wonderful and thank you for the tip. I will try and see about my other postings. What is your favourite period out of interest? Thats Difficult to Answer at the moment I'd say my primary interests are Ancients and WW1, though WW1 has taken a backseat recently... but generally I'm interested in all Historical subjects some more then others..
Overview of the battlefield from the mill at Thyle looking towards Ferme de Gemioncourt with the crossroads in the top right corner. Looking west towards the crossroads with the Ferme de Gemioncourt and stream on the left. The Dutch militia are stationed on the chemin Bati-Saint-Bernard showing the difficulty facing 2nd Netherlands Division in covering so much ground with so few troops. View towards Ferme de la Bergerie with Nassau reserves by Ferme des Quatre Bras. Looking west towards the etang Materne. Dutch 27th Jagers line the hedge to the right with a Dutch horse artillery element [ 2nd Lieutenant Koopman] looking down the Namur road. 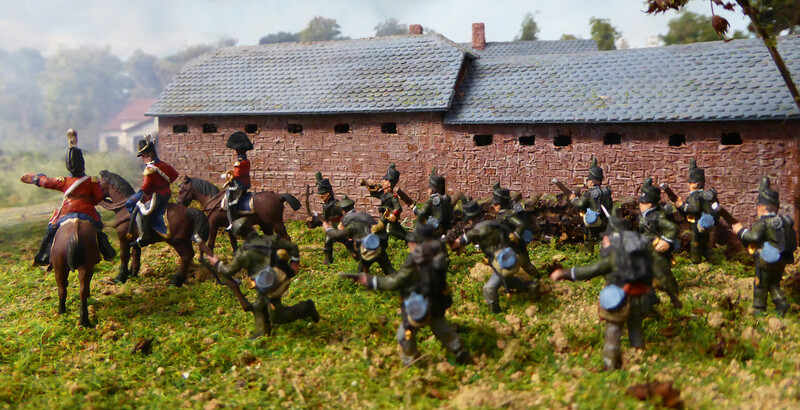 7th Belgian line battalion positioned by Ferme de Gemioncourt. The tall nature of the crops is evident, causing movement and command problems for both sides. 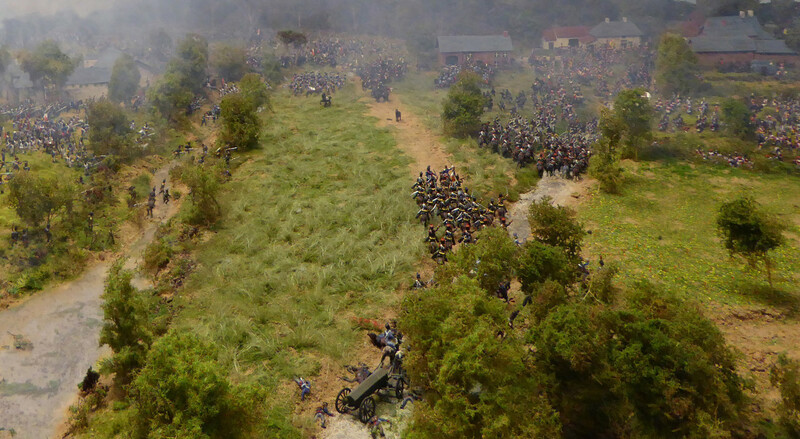 The French artillery commence the engagement by opening fire on the Dutch Belgian artillery, practically the only visible target due to the height of the crops and the dispersed nature of the Allied defence. The French 5th Infantry Division, Lieutenant-general Baron Gilbert-Desiree Bachelu, begins the advance. 1st Brigade, Marechal-de-camp Baron Pierre-Antoine Husson is directed towards the farms of Lairalle and Piraumont supported by 1st French cavalry Brigade, Marechal-de-camp Baron Pierre-Francois Huber. 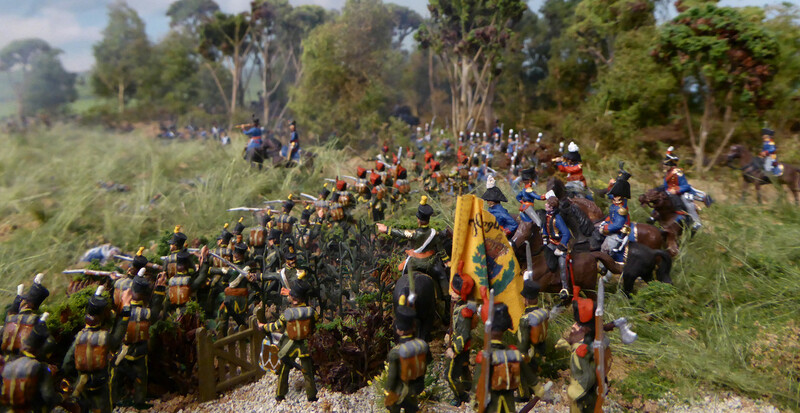 The 2nd Brigade,Marechal-de-camp Baron Toussaint Campi advances towards Ferme de Gemioncourt but is hampered by the difficult terrain and the du Pre des Quelles stream. 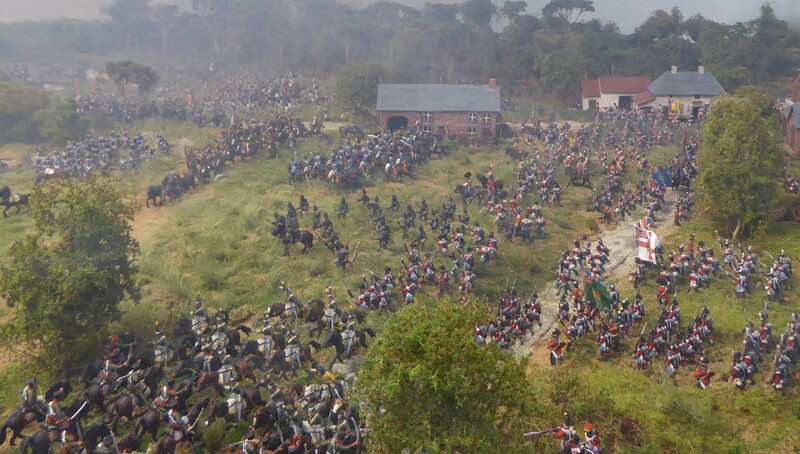 This movement is supported by cavalry from the 2nd Brigade, Marechal-de-camp Bron-Francois-Isidore Walthiez. Dutch Jager contest the advance. 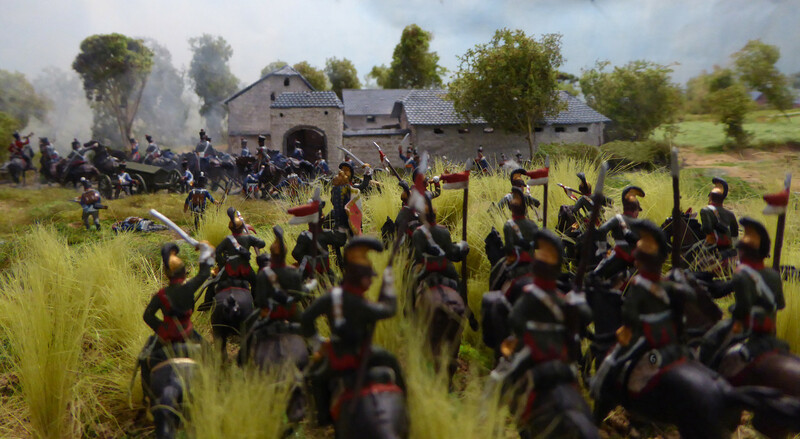 9th French Infantry Division , Lieutenant-general Maximilien-Sebastian, Comte Foy commences its advance towards the crossroads of Quatre Bras. The Emperor will reward every man who goes forward. 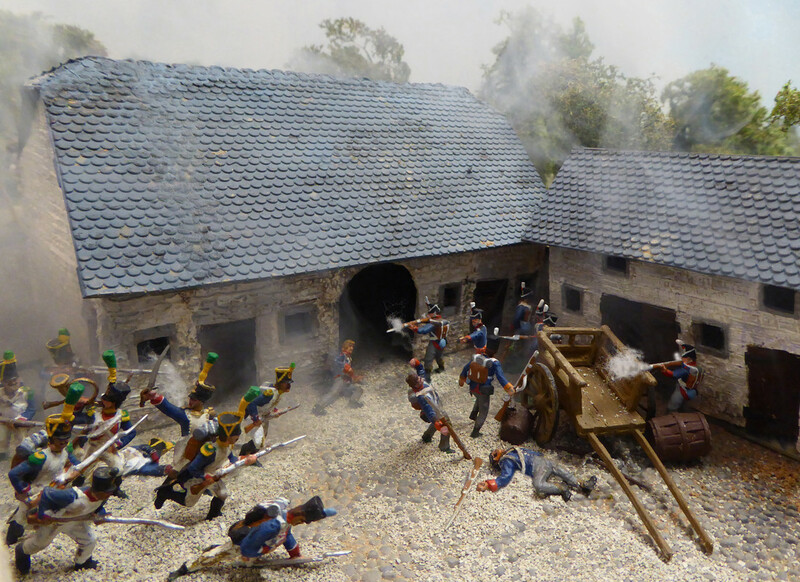 It might become a bit boring to hear another excited comment but of all the projects on the Belgian campaign of 1815 - and there are some really impressive efforts out there - I think yours is the cherry on top. It was so interesting to observe how you constantly improved everything from terrain, scene settings to the general plot development, not to speak of all those incredible conversions that give your settings so much life. Your Quatre Bras is the perfection. The quality of the photos is superb, and does justice to your constant improvement of your artist's eye for a snapshot, a development I found so interesting to observe. I am most facinated by those image details that can conjure up mass troop deployments by showing a handful of figures from the right perspective, a few extras needed only with that inspired procedure, and no CGI nonsense. What we get now is a movie director's effort, a plot development that takes its time, with small vignettes introducing the audience into the bigger events that are to follow, everything like the movie we all wanted to watch, and that unfortunately never was. Cannot wait to see how things will further unfold. All I can do is to repeat a famous quote: "We're not worthy, we're not worthy!" 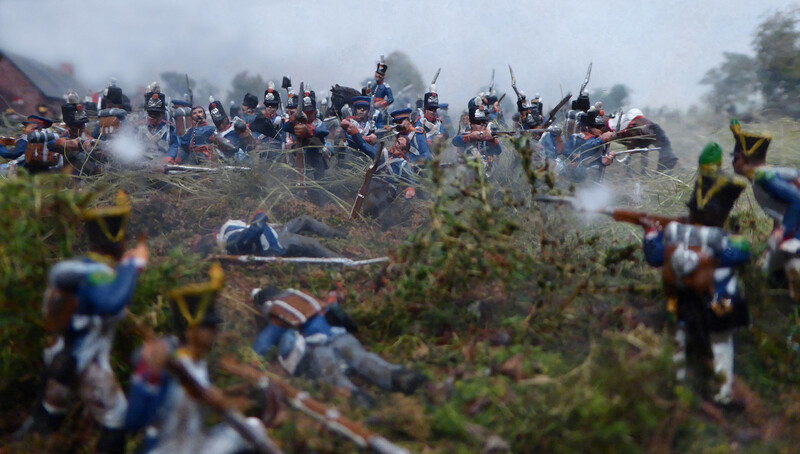 Is it possible you forgot to post the photo that belongs to your last sentence, "9th French Infantry Division, Lieutenant-general Maximilien-Sebastian, Comte Foy commences its advance towards the crossroads of Quatre Bras. The Emperor will reward every man who goes forward"? Thank you very much for your kind and generous comments. They are most appreciated. My knowledge has increased massively with each re fight . However it is the kind input and suggestions of fellow modellers that add to the 'ideas pool',and inspire further effort. The comment about Foy is slightly misleading. I was going to show his divisions approach but the camera angle is not conducive to a good picture. However as this advance was important I thought it best to mention it. Good spot. He will be available at 2.15 PM! Thank you again for taking the time to post. 9th French Infantry Division, Lieutenant-general Maximilian-Sebastion Foy is advancing towards the crossroads. 2nd French Brigade, Marechal-de-camp Baron Jean-Baptiste Jamin advances on Gemincourt. 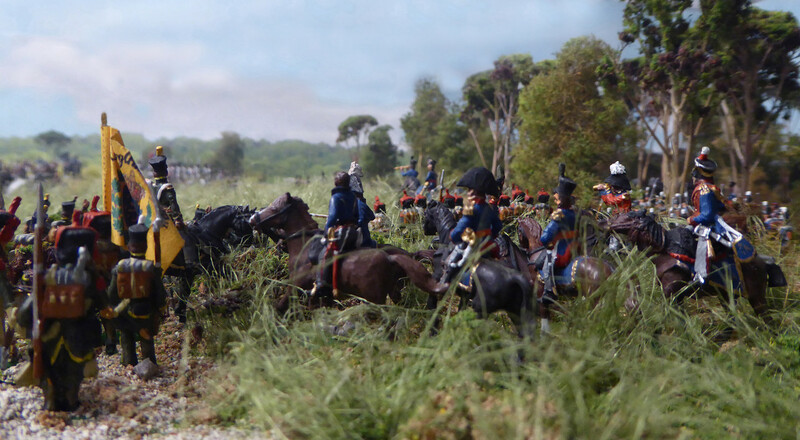 1st French Brigade Marechal-de-camp BaronJean-Joseph Gauthier is advancing down the Brussels road clearing Nassau opposition into the Bois de Bossu. 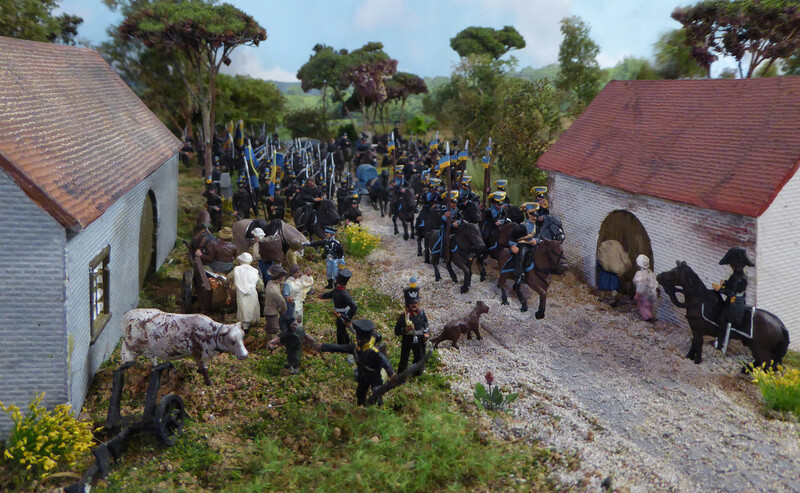 Dutch horse artillery, Captain Adriaan Bijleveld commanding are threatened by 6th French lancers, Colonel Nicholas-Marie de Galbois commanding and begin to withdraw from the Gemincourt position. 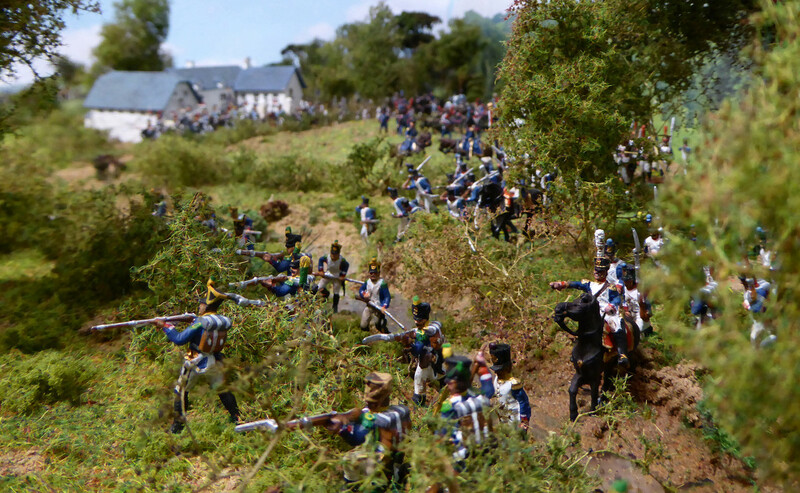 Belgian Foot artillery, Captain Emanuel Stevenart commanding, contest the French advance. The view from the Bois de Bossu towards the 7th Belgian line infantry, Lieutenant-Colonel Francois van den Sande commanding. The Allied line is in danger of being engulfed by the French advance. Every man must stand and fight. Last year i visited Waterloo and Quatre Bras again. The Bois de Bossu doesnt exist since 1880 and therefore is it not easy to find the exact locations of some parts of the QB-Battle. French 2nd Legere, Colonel Pierre-Francois Maigrot commanding, upon discovering the Ferme de Piramount is not occupied by Allied forces, continues its advance towards Thyle. 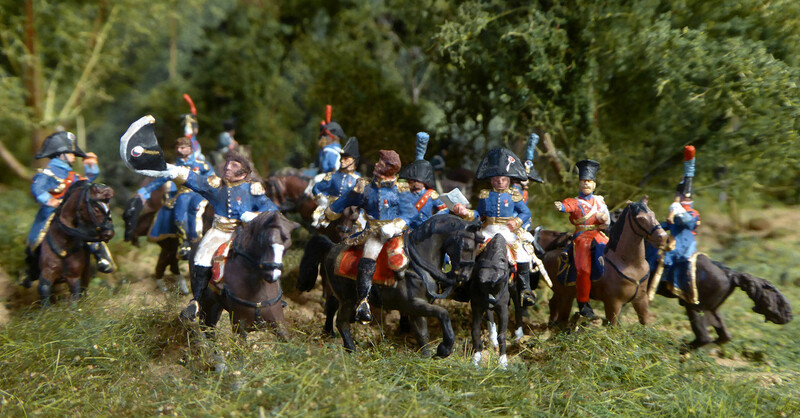 They are supported by the 1st regiment, Chasseurs a Cheval, Colonel Pierre-Joseph Simonneau commanding. 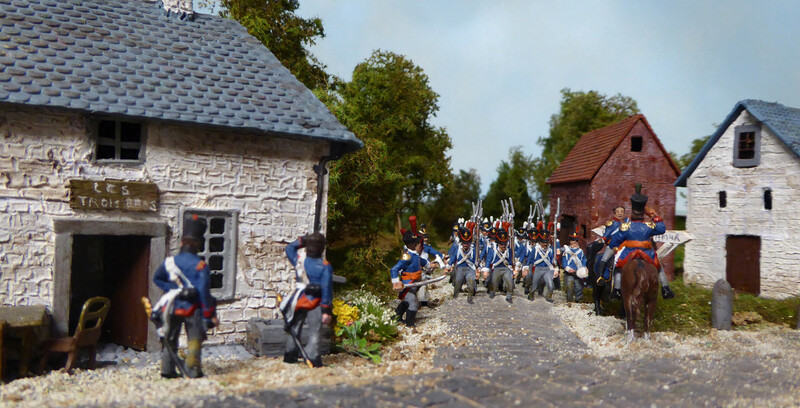 This regiment has occupied the village of Thyle thus cutting the Allied line of communication between Quatre Bras and Ligny. 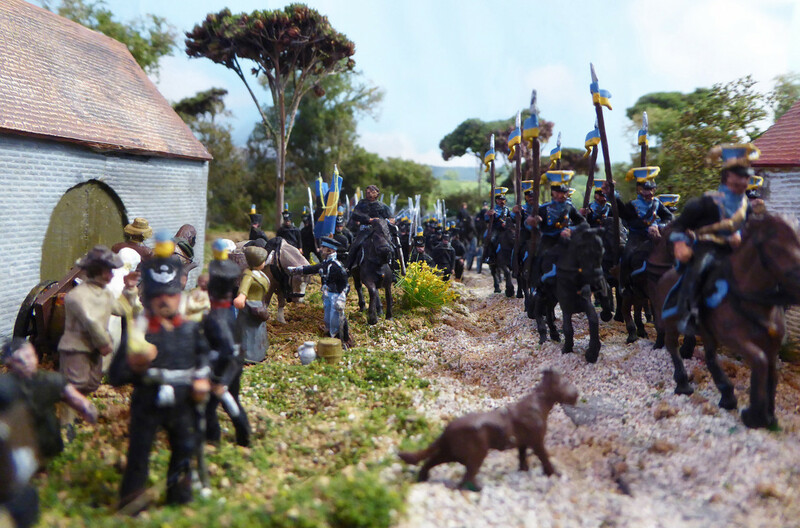 The Duke of Wellington and his entourage returning from his meeting with Feldmarschall Blucher discover this uncomfortable fact and are forced to make a wide detour in order to return to his command. 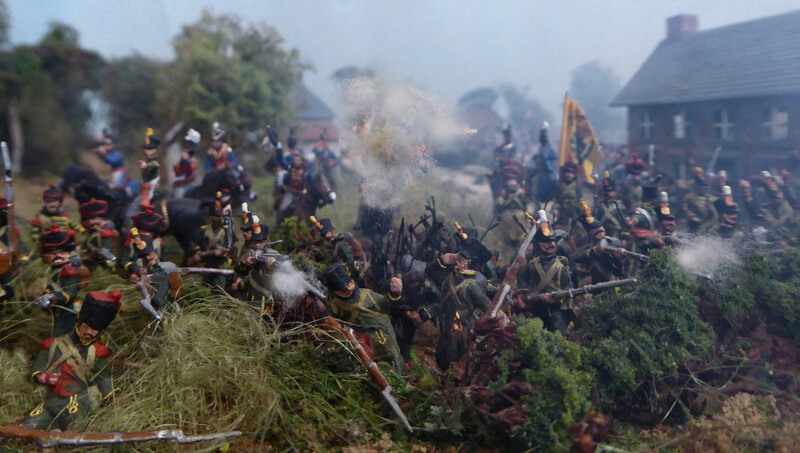 6th Regiment, Chasseurs a Cheval commanded by Colonel Paul-Eugene de Faudouas are engaging the Dutch 27th Jagers, Lieutenant-Colonel Willem Grunebosch. The French 4th Legere Colonel Vincent Peyris is assaulting Ferme de Gemincourt supported by the advance of 2nd Brigade, 5th Infantry Division ( Marechal-de-camp Baron Toussaint Campi). As the pressure grows on the Allied position the remaining reserves are summoned. General Willem, The Hereditary Prince of Orange-Nassau, leads the 5th Dutch militia forward in order to support their comrades in Gemincourt. Allied forces are heavily engaged in the outskirts of the Bois de Bossu in an effort to slow the French advance. 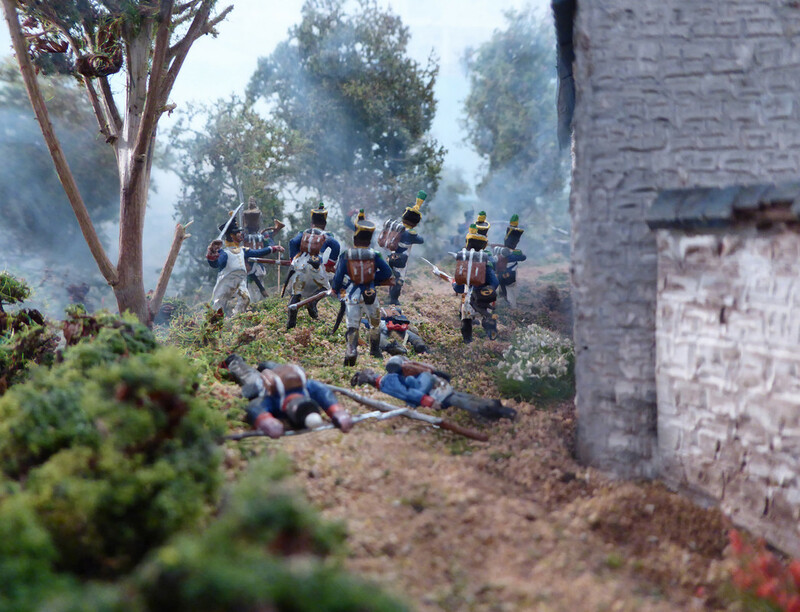 However, the 7th Belgian Line, Lieutenant Colonel Francois van de Sande whilst attempting to form square, has been attacked by the 6th French lancers, Colonel Nicholas-Marie de Galbois commanding. The French advance is remorseless but Dutch Belgian resistance is fierce. Leave de Prinsen van Oranje! Another incredible post Chris, excellent work on all fronts. But it does look like a most desperate struggle. 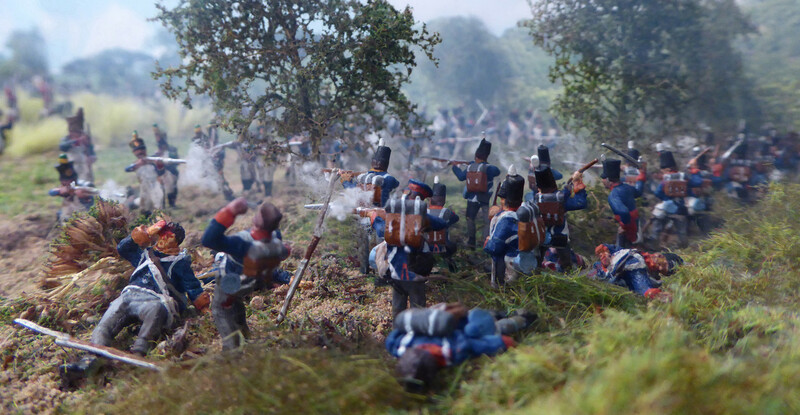 I hope the Belgian 7th Line were not too badly mauled, they put up a tennacious fight in the original. 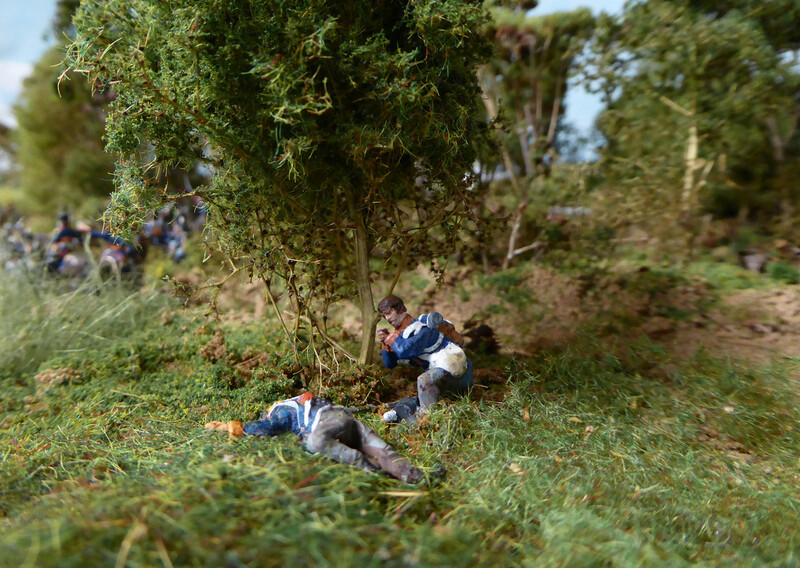 6th Regiment, Chasseurs a Cheval have routed the Dutch 27th Jagers, riding them down mercilessly. 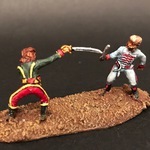 1st Regiment, Chasseurs a Cheval, Colonel Pierre-Joseph Simonneau, have caught 2nd Lieutenant Koopmans horse artillery element in the process of limbering up with disastrous consequences. This has left the Dutch Belgian left flank in the 'air'. 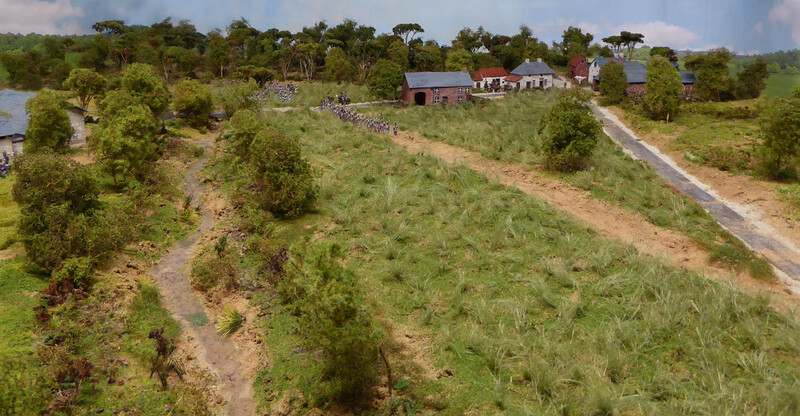 The Ferme Gemincourt falls to the French 4th Legere and elements of the 2nd French infantry brigade. The original Dutch Belgian defensive position has now been completely destroyed. Elements of the 1st French Brigade, Marechal-de-camp Baron Jean Joseph Gauthier comanding are advancing into the Bois de Bossu pushing back the stubborn Dutch Belgian resistance. 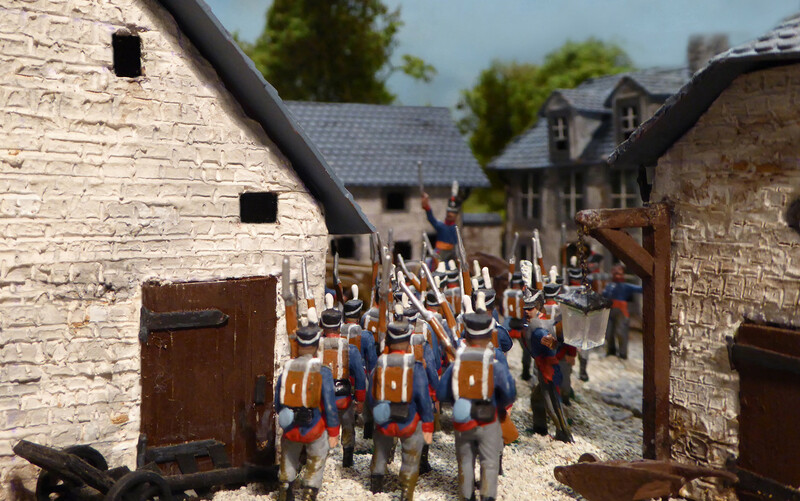 General Willem, The hereditary Prince of Orange-Nassau establishes his final line of defence centred on the Ferme La Bergerie and anchored to the Bois de Bossu. 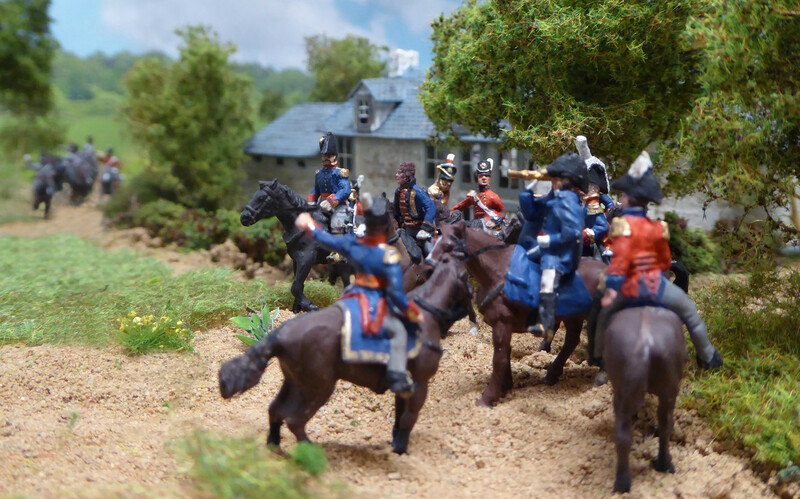 However, good news for the Prince arrives in the form of 2nd Netherlands Cavalry Division, commanding officer, Major-General Baron Jean-Baptiste van Merlen. The 6th Dutch hussars, Lieutenant Colonel Willem Boreel commanding is in the vanguard. Contemporaneously, His Britannic Majesty's 95th Regiment of foot, in the position of honour, begin to arrive after a long march from Brussels. 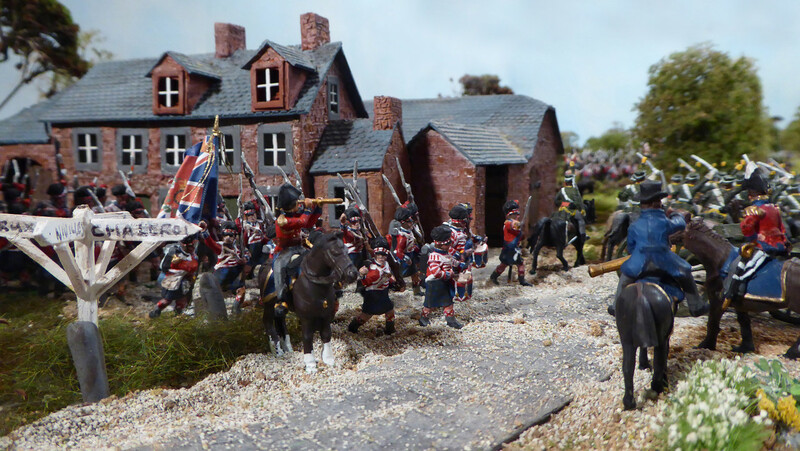 These veteran troops form part of 8th British Infantry Brigade and its officer commanding, Major-General Sir James Kempt supervises their deployment in the absence of his Grace, The Duke of Wellington. 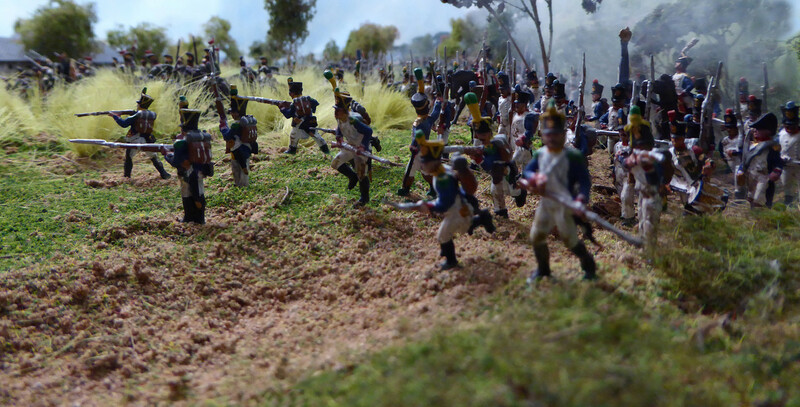 Nevertheless, the French, led in person by Marechal Michel Ney, 'The bravest of the brave' advance relentlessly towards the vital crossroads. Vive l'Empereur, La Victorie est a Nous! This is outstanding! So historical accurate! This really looks like how I always have been fantasising about my toy soldiers, daydreaming of making big displays and setups like these! This can be(come) a great book! Happy New Year Stan and thank you for your kind comments. 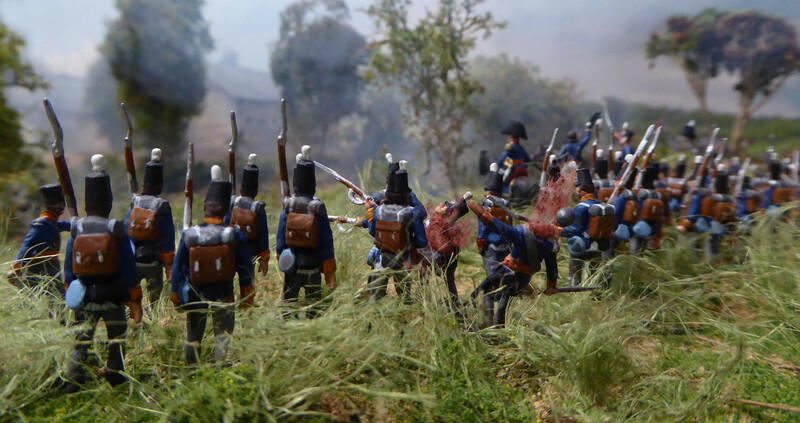 I am just finishing off Picton's fifth Division and indeed some ideas are illustrated on the other Quatre Bras, making of HAT link. If you like this you might like the Schlact Von Ligny postings on HAT. I think they are still ok but otherwise Bennoes Figures Forum has the whole story. Anybody speak french by any chance ? French 9th Infantry Division, Lieutenant-general Maximillien-Sebastion Foy commanding has captured the Ferme de Gemincourt and is advancing towards the crossroads led by Marechal Ney himself. French 5th Infantry Division, Lieutenant-general Baron Gilbert-Desiree Bachelu is approaching the Gemicourt stream in support. The advance is slow due to the difficult terrain. 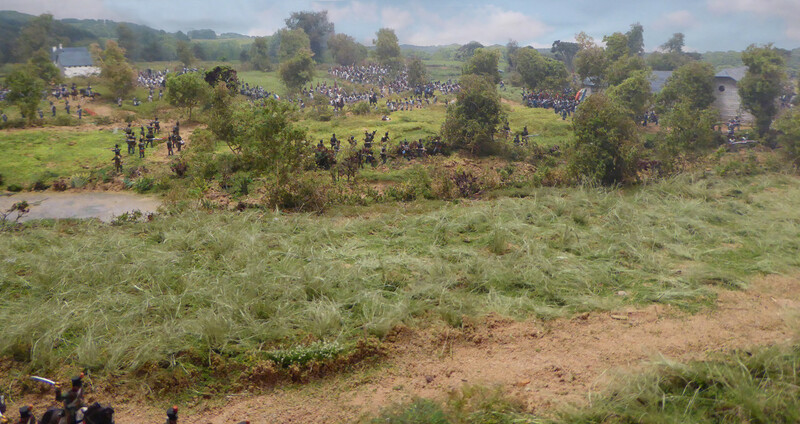 Nevertheless the Dutch Belgians have been pushed back across the Gemincourt stream. 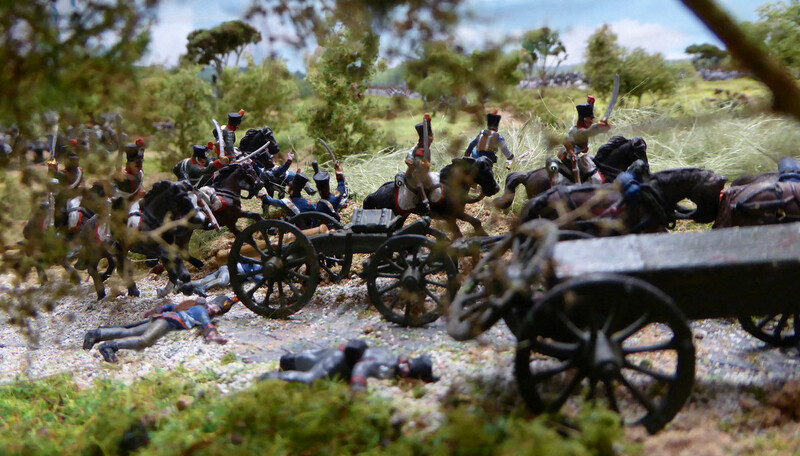 French 6th Regiment de Chevau-Leger Lanciers have attempted to charge the 5th Dutch Militia. 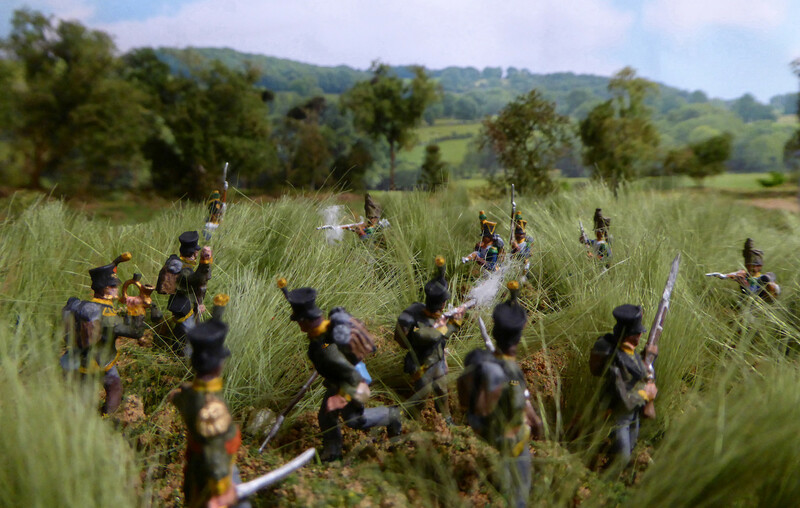 However the Dutch, Lieutenant-Colonel Jan Westernburg commanding have formed square in time and repulse the attack. Contemporaneously, 2nd Legere, Colonel Pierre-Antoine Husson along with 1st Cavalry Brigade, Baron Pierre-Francois Huber have outflanked the Dutch Belgian line of defence and are now advancing down the Namur-Nivelles road towards the crossroads. However,British 8th Infantry Brigade, Major-General Sir James Kempt has begun to deploy along the Nivelles Namur road. 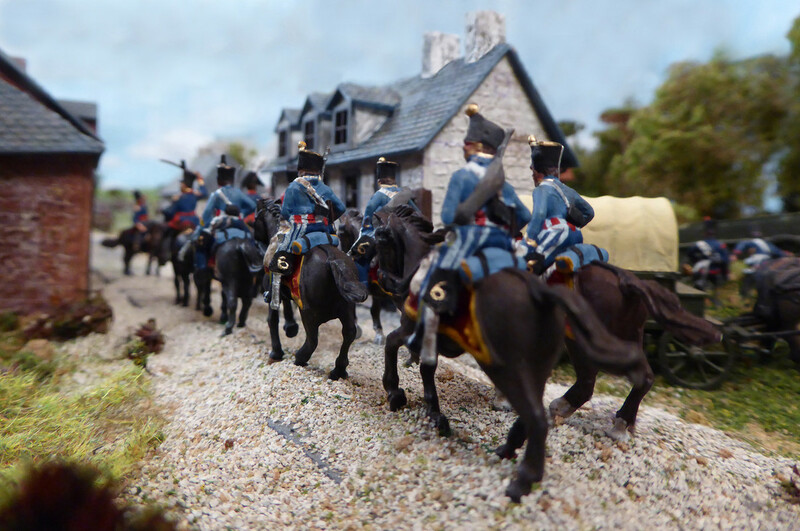 Simultaneously the Netherlands 2nd Light Cavalry Brigade, Major-General Baron Jean-Baptiste van Merlen begins to deploy to frustrate the French cavalry. In the absence of his Grace The Duke of Wellington, Lieutenant-General Sir Thomas Picton directs the deployment of the British 9th Infantry Brigade, Major-General Sir Dennis Pack commanding. 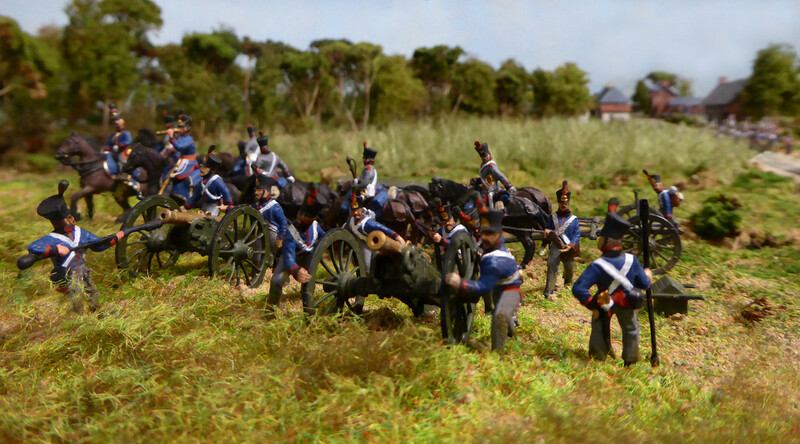 Some much needed artillery support arrives in the shape of Brevet Major Thomas Rogers and his No.2 Company Royal Artillery. 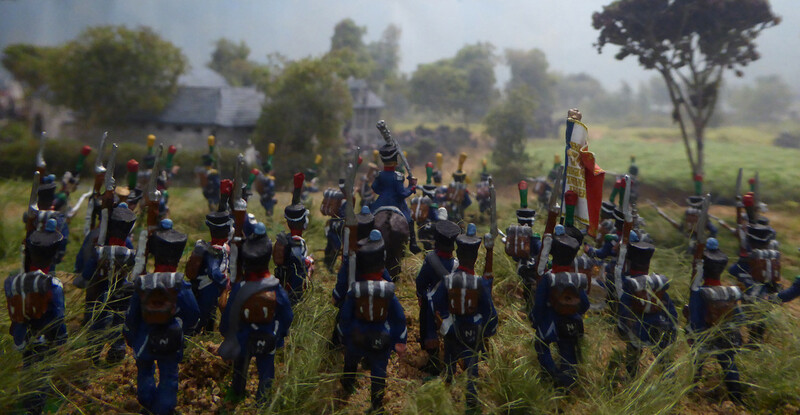 By leading from the front Marechal Ney is unaware that the French 6th Infantry Division commanded by Lieutenant-general Prince Jerome Bonaparte has arrived supported by 2nd Brigade 11th Cavalry Division, Marechall-de-camp Baron Marie-Adrien Guiton. Ney is in his element, L'empereur recompensera celui qui s'avancera! I have been watching this for some time; regrettably, I haven't commented even though I've been an admirer. I will say now that you have achieved with this diorama and these pictures what most of us hope to achieve in our own endeavors. Many thanks for sharing you superb work. French 9th Infantry Division, Lieutenant-general Maximillien-Sebastien Foy commanding is approaching the Allied position anchored on the Ferme La Bergerie. The French Divisional and Corps artillery, having re-deployed by Ferme Gemioncourt. display their professionalism by subjecting the Allied troops to a devastatingly effective bombardment. 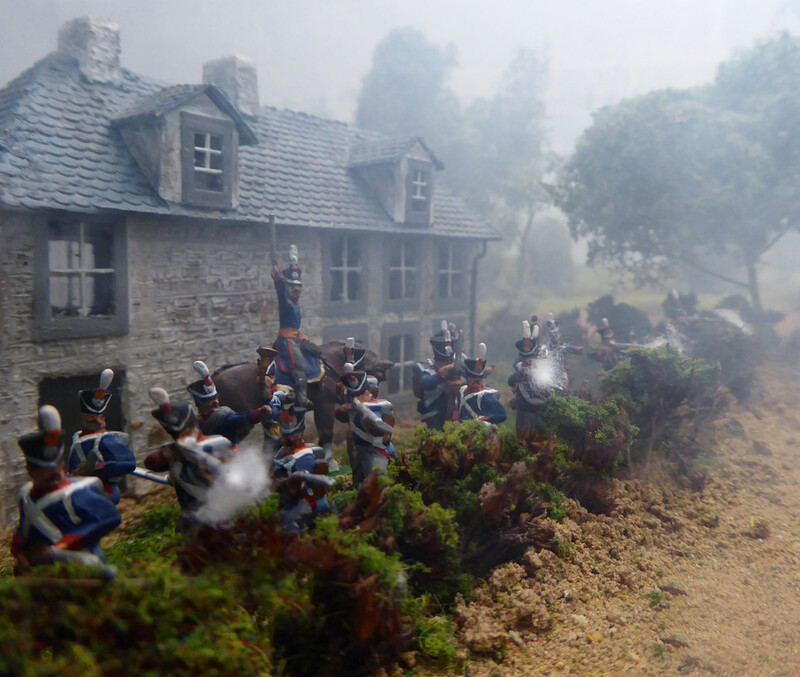 5th Dutch Militia., Lieutenant-Colonel Jan Westernburg commanding are pinned by French lancers in square and are being subjected to a lethal tiralleurade from voltigeurs in the Gemioncourt stream. His Grace, The Duke of Wellington has returned from his unexpected detour and is now back in command. 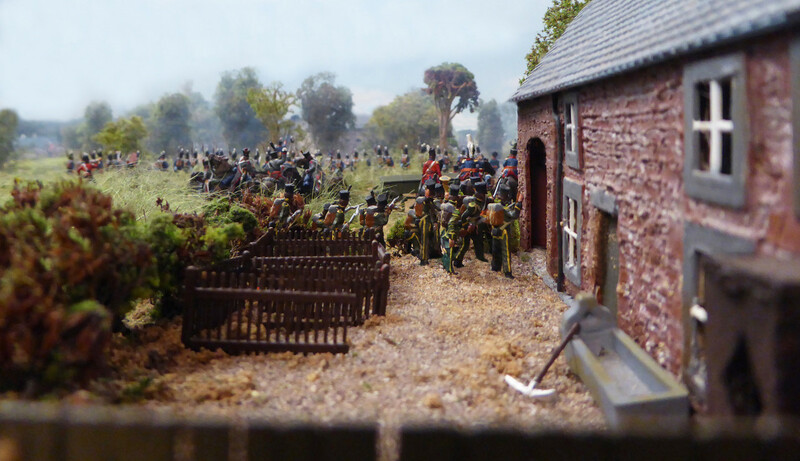 The British 5th Infantry Brigade , Lieutenant General Sir Thomas Picton commanding, continues its deployment. 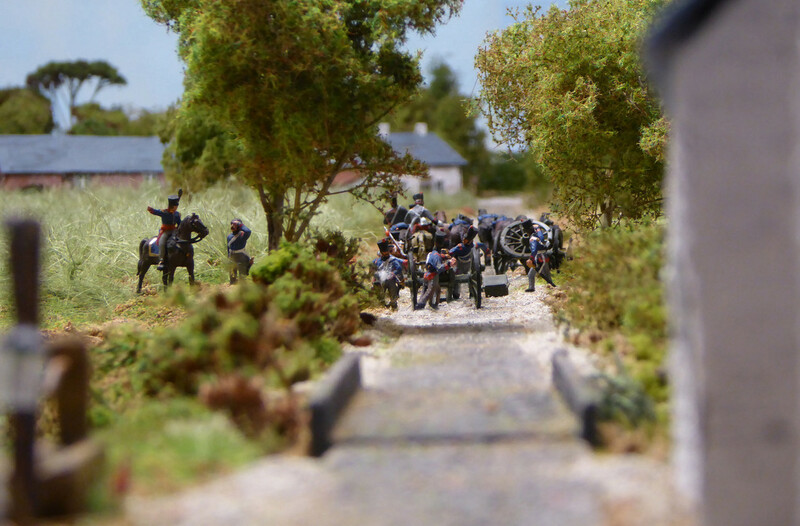 Contemporaneously, 6th British Infantry Division, Colonel Carl Best commanding, begins to deploy en potence on theAllied left flank using the Vallee des vaches stream in order to confront the the French advance. Elements from 2nd Legere Colonel Pierre-Antoine Husson, scout the Thyle watermill and the approach to Bois de Censes for Allied troops. 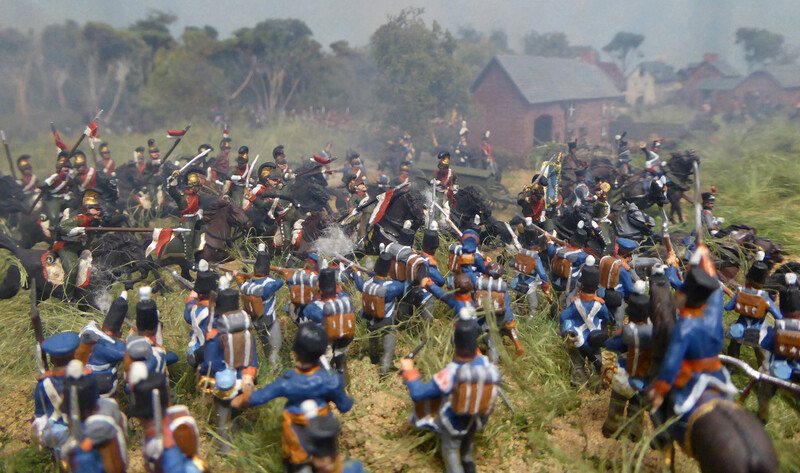 The Dutch 6th Hussars, Lieutenant - Colonel Willem Boreel commanding, along with Major-General Baron Jean-Baptiste van Merlen charge the unformed French 6th Regiment de Chevau-Leger Lanciers. 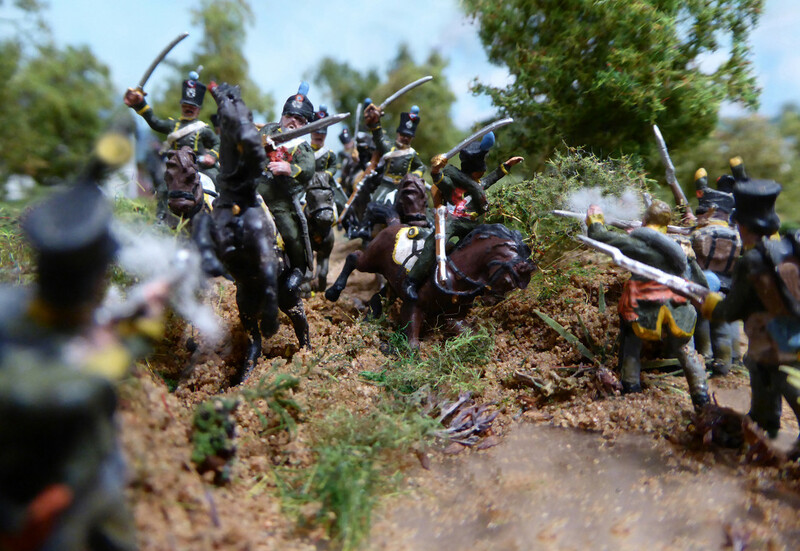 Their colleagues from the 5th Belgian light dragoons, Lieutenant-Colonel Edouard de Merx are simultaneously engaging the French 1st Chasseurs a cheval under the command of Colonel Pierre Joseph Simonneau. 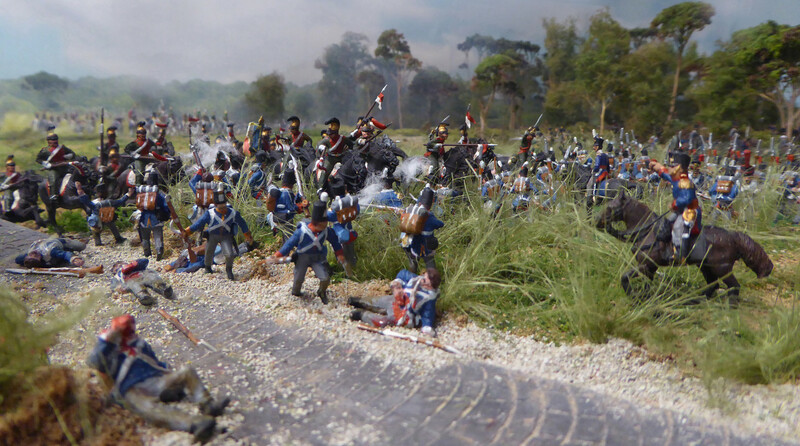 Meanwhile in the Bois de Bossau the French 1st Legere, Colonel Amedee-Louis Cubieres commanding is heavily engaged by the Gemioncourt stream. 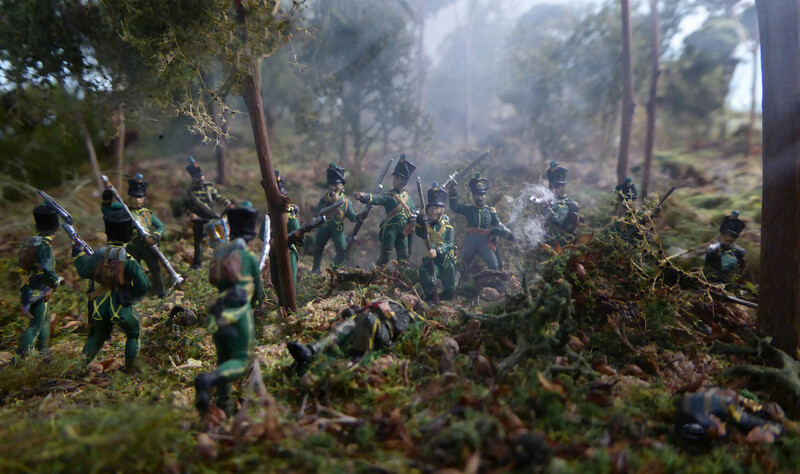 This Nassau line of resistance is currently the last obstacle to the French advance through the wood. 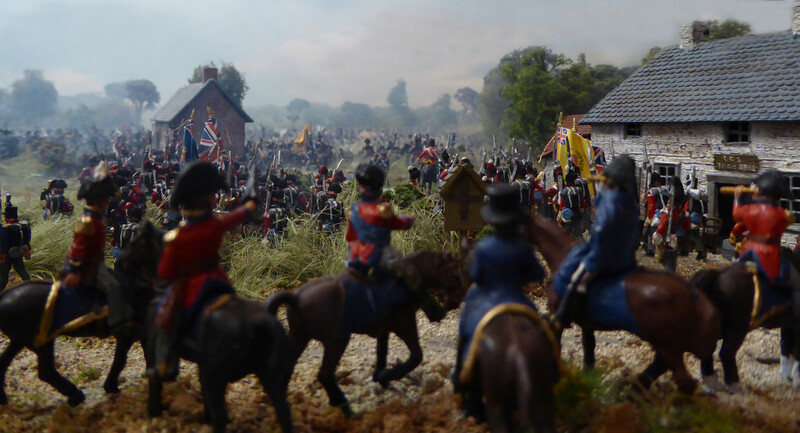 The Anglo Dutch force is now seriously threatened but welcome reinforcements in the form of the Brunswick Corps, General Fredrich Wilhelm, Duke of Brunswick commanding, are fast approaching Quatre Bras. The sands of time are running out, but for whom?